Getting 5-star reviews online is simple and free with our solution. Online review websites already provide the tools you need to effectively gain, share, and monitor your reviews. All you have to do is start the process by emailing a link to your satisfied patients. You simply email a link that we provide to the patient, which asks if they were satisfied with their visit. If the patient is not satisfied, we display a private survey form that gives them the opportunity to provide actionable feedback. The survey is only emailed to you and not displayed online. This helps weed out the bad from the good. 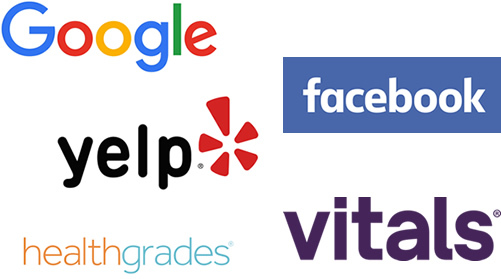 If the patient is satisfied, we display links to your Google™, Yelp™, Facebook™, and Healthgrades™ profile pages so they can pick their favorite review website. After satisfied users complete the online review, the review websites prompt the user to share on social media. You will also receive an email anytime a review is submitted, so you can easily monitor the reviews. This just requires you to take control of your listing, which you should do any way as you don't want a 3rd party to control your listing.